So I’ve been thinking about what exactly I want to do with the theoretical knitting idea (besides come up with something to talk about that does not involve how many stockinette stitches I have knit this week!). Mostly, I think I just want a place to capture ideas outside of my design notebook, and to make for more interesting writing that will keep me coming back to chat on the blog, even amidst all the craziness of fall. Also, I find it really helpful to have a reason to think up new ideas. Design is one of those things that works best when the pump is primed, and if you wait too long in between it gets harder and harder to come up with things. Ideas breed ideas, and before you know it you’re drowning in them. It’s a cruel cycle, really: you’re only coming up with thousands of designs when you already have too many projects and not enough time to do them. If you’re able to capture those ideas when they’re flowing, then they also manage to carry you through the dry spells when your creative powers are needed elsewhere. 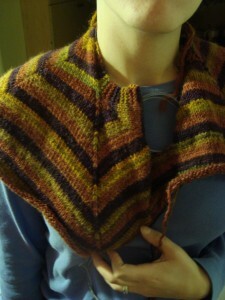 It’s no coincidence that I’m still knitting projects that I dreamed up in Germany, back in 2009. 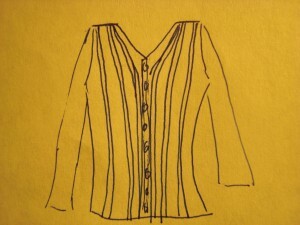 A tiny hint of a knitting idea can go a long way. I have looked around for proper attribution, but the best I can come up with is a tumblr link. I’d love to know where it came from, because I bet that photographer has a million other things I’d love to pin. I am fascinated by the mix of orange and purple near the head, and those brilliant spots of white right at the hem. That last bit got me thinking. The hem. 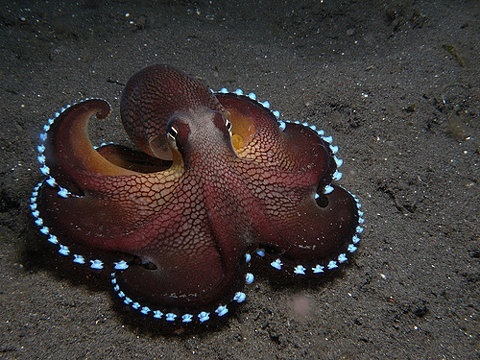 Wouldn’t his skirt make a beautiful shawl? I’ve drawn inspiration from sea creatures before; they are masters of using simple design to create flowing, graceful structure. Nature has an excellent eye for proportion. But then, I think I’d want to knit the body of the shawl in stockinette, and knitting enough stitches in those long final rows to make that many scallops might just kill me. So what about short rows? 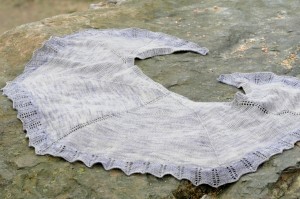 That would let you keep that stunning contrast row right at the end, and would allow it to continue up into the body of the shawl the way those white dots follow the edge of each scallop right up into the body of the skirt. 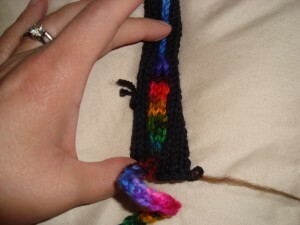 It would also break up the stitches into much shorter, more manageable rows. 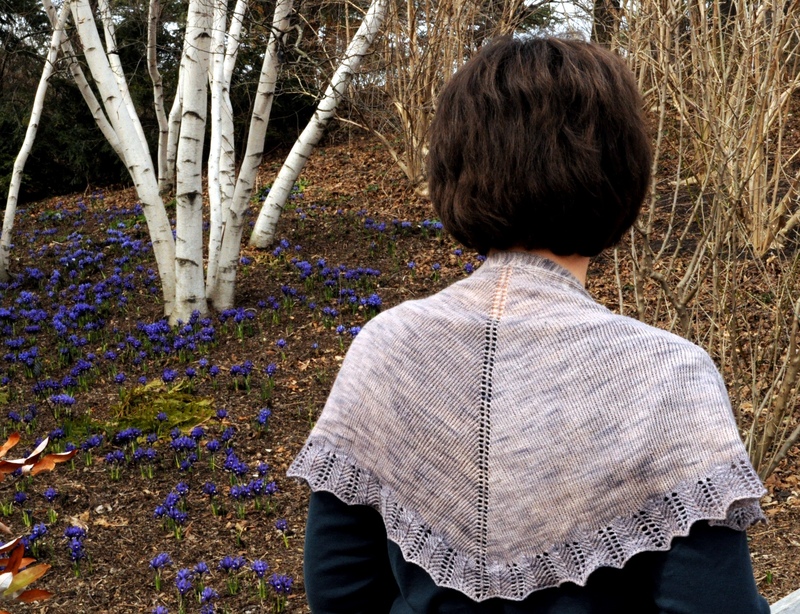 What if you started at one end, knit a small semi-circular shawl, worked the contrast edging, and then picked up stitches and continued on with the next? 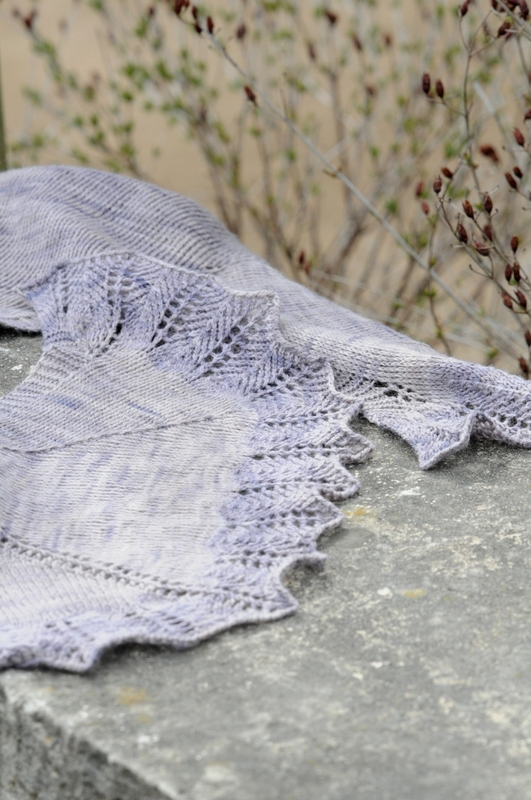 You’d work your way around the shawl, adding scallops as you went. 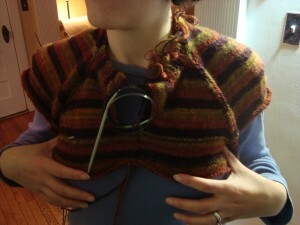 No super long rows, and very simple knitting. You could do so many different things with the colors, too. 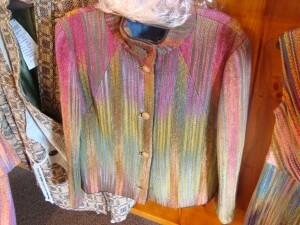 Imagine this knit in a gradient yarn, or with two highly contrasting stripes to emphasize all those graceful curves. 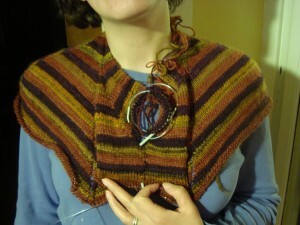 On the one hand, the shawl could be a beautiful, eye catching design. On the other hand, you might end up walking around looking like an octopus with a slightly shrunken head. You know – the usual fashion risk. 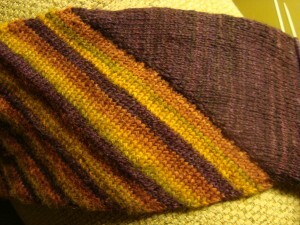 For now, the practicality likely doesn’t matter, given that this is theoretical knitting after all. Still, I think this is an idea that might be worth coming back to. It smacks of promise, and I do really like those curves. 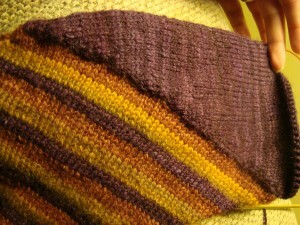 The striped shawl sweater has been slowly creeping slowly forward with the same knit-rip-knit pace. 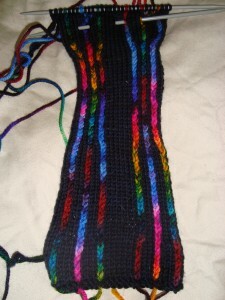 I’m past the striped section and have been working short rows to transition into the main body color. I started out decreasing one stitch for every three rows that I knit, which looked pretty good at first, but looked less good as the fabric grew. I worked short rows for both of the sleeves and half of the body before deciding that it looked a little too puffy. See how there’s a bump at the edge of the dark fabric? Well. It was bothering me. So I ripped it out, and reknit the short rows, decreasing one stitch for every 2 rows instead. 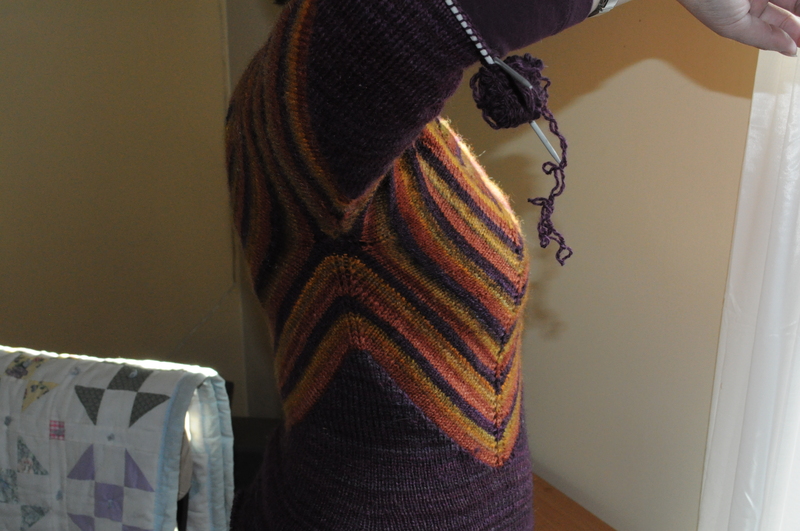 I’ve since redone the short rows, and finished the main body section. 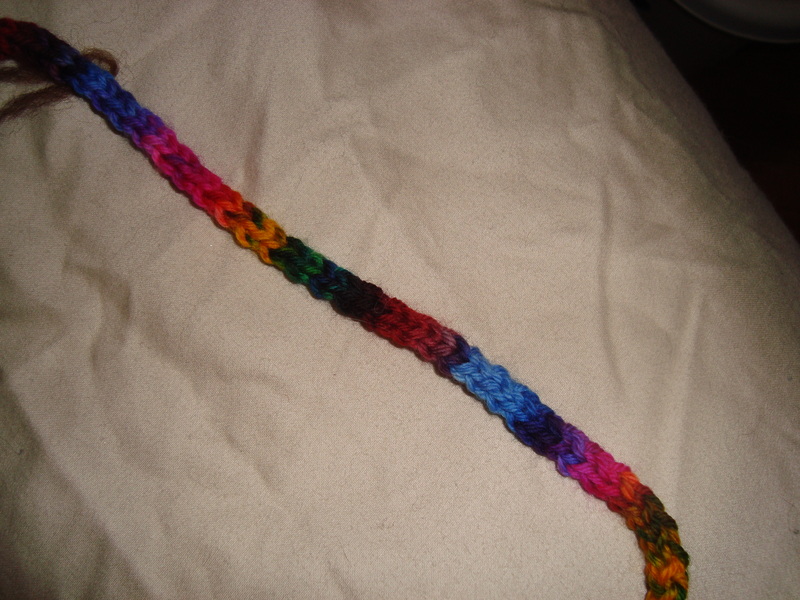 I had to spin some more yarn to make it, but I am very happy with how it’s coming out. I am to the elbows on the sleeves and I am running on yarn fumes, so I’ll need to spin up another hundred yards or so to finish it off. I hadn’t counted on the short row decreases to add so much shaping, and I added a few of my own, which turns out to have been unnecessary. The final fit ended up a tiny bit tighter than I’d like, but I think it will loosen up with blocking and I don’t think it’s enough of a problem to rip back again. This project may finally be in the home stretch. 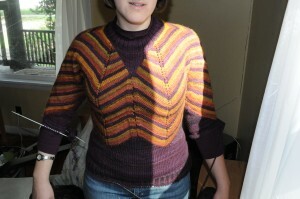 All that’s left is finishing the sleeves, and then steeking the front to install the zipper. It’s getting close! 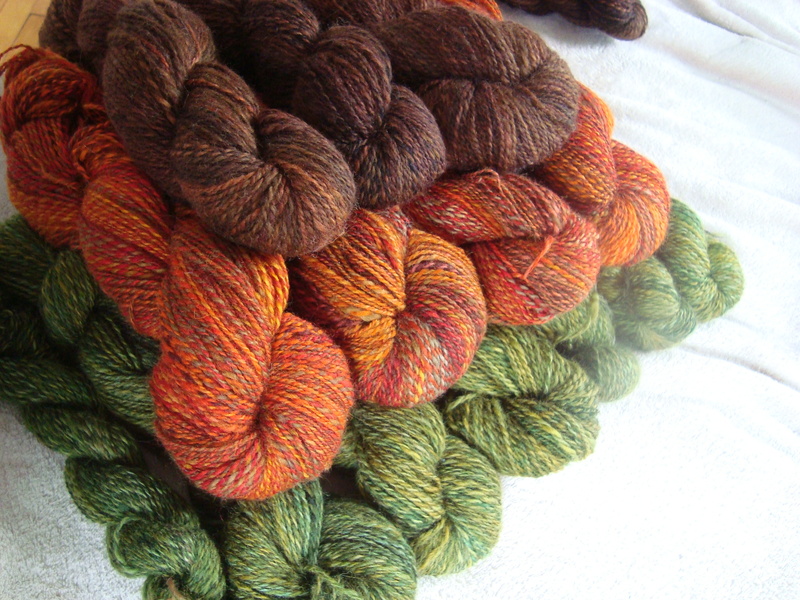 While I’ve been knitting the striped shawl, I’ve been keeping my spinning wheel busy finishing up the green for the fall colors sweater. Doesn’t she have a lovely fleece? I liked it well enough in the roving, but it wasn’t until I started spinning it that I realized how beautifully heathered the gray is going to be. I have to admit that I have been struggling to resist the temptation to claim this wool as mine (as it was originally intended to be), but I am going to stick to the current plan. There will always be more fleeces, and I am getting to have a lot of sweaters! 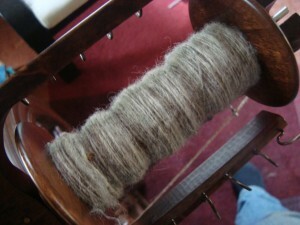 One thing that has been very interesting about this set of projects is spinning from three fleeces from the same farm. You’d think they’d be pretty similar, given that they are three sheep fed and coated the same way, living in the same flock. 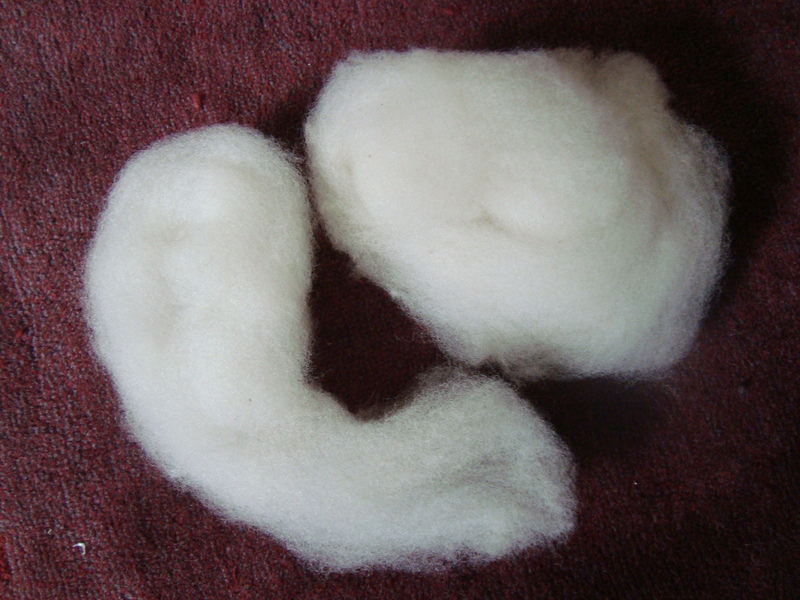 The wool was presumably sheared by the same shearer and processed by the same mill. 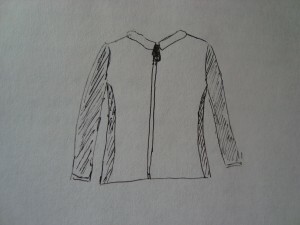 But the fleeces are not the same. 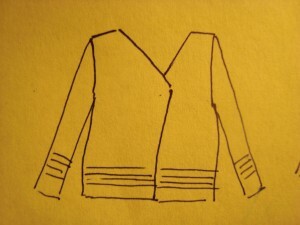 As a reminder, MacGyver’s is the light gray wool in the sweater, and Magnolia’s is the dark brown. MacGyver’s wool was kind of downy, but had lots of heavier guard hairs in it. I tried picking them out as I went, but enough stayed in to make the sweater slightly prickly when worn on sensitive skin (fortunately, Branden doesn’t mind). As Branden has worn the sweater, the guard hairs have tended to poke out here and there, and we’ve been pulling them out over time. 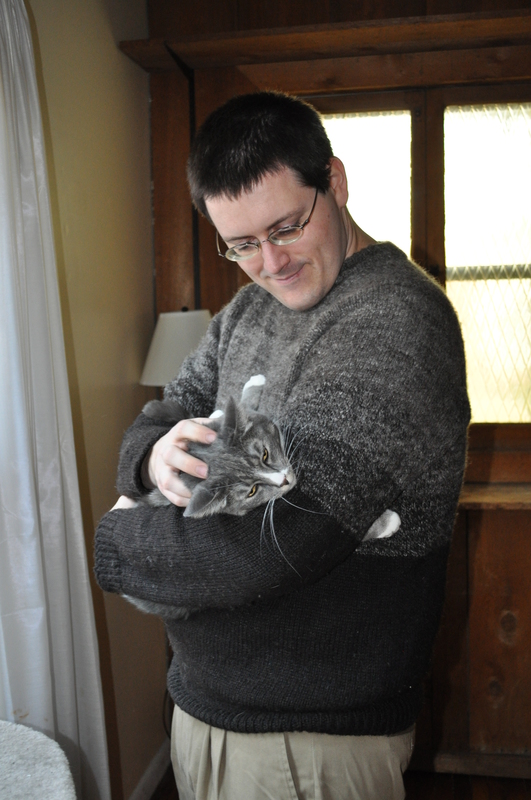 I’m not sure that it’s making much difference, but I like to think that the sweater is getting softer and softer with time. Either that, or we’re helping it to fall apart faster, but I’m sticking to the first interpretation. MacGyver’s was the first wool of the three that I spun, and it was full of little pills of short fiber, like the wool had been slightly tipped or there were second cuts in the shearing. I must admit that I was not looking forward to spinning three big bags of wool like that; pills in the spinning make me crazy. 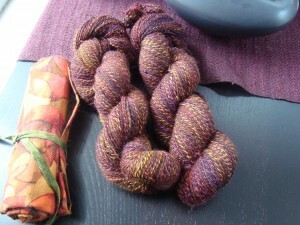 But the fiber was beautiful otherwise, and I loved the yarn, so I kept spinning. Magnolia’s wool had none of the pills, and none of the guard hairs. It was a much thicker feeling fiber, very smooth and greasy, almost like alpaca. The pills must have been from MacGyver and not from the mill, since both Magnolia and Harriet’s fleeces are pill-free. Harriet’s fiber is different yet again. 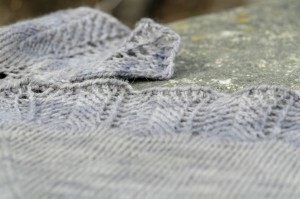 It is much lighter than Magnolia’s and very soft, more like the downy fleece in MacGyver’s wool. There aren’t many guard fibers at all, though there is a lot of hay. Harriet loved to wear her hay. I pull little bits out as I’m spinning, and I can’t help but imagine this sheep standing by her hay bale, munching away, pulling it down on top of her shoulders. Fortunately, most of it pops right out while I’m spinning, so it’s not a big deal, but it does amuse me to think of how this sheep must have always been wearing her food. While I knit one sweater and spin toward the next, I’ve also been taking advantage of the beautiful weather to get outside and comb some more of my Gulf Coast fleece from last year. It is slow going, preparing a whole fleece by hand. 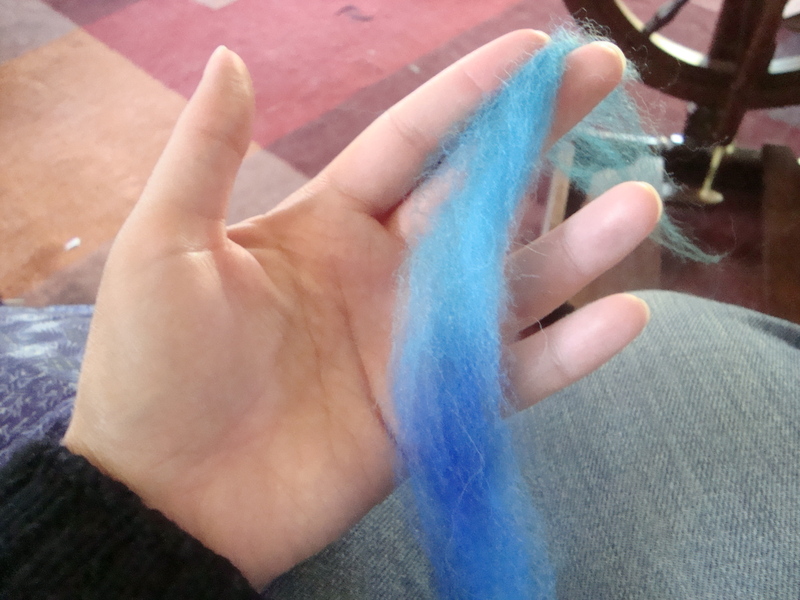 I spun up most of what I had combed at Christmas to give to a friend, and I’ve only done a few ounces since then. It will be quite a while before I work my way through the whole 2.5 lbs, but it is very satisfying to see my bag fill up with these airy little puffs of fiber. 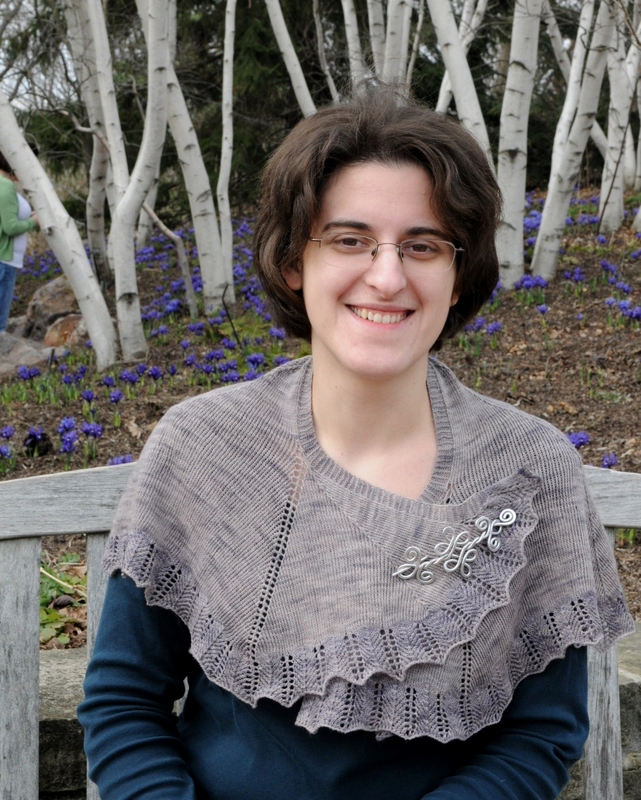 When I realized that the striped shawl sweater was in fact going to be a sweater and not a shawl, it freed me up to finish the spiral shawl that has been languishing on the needles for ages. The idea for this pattern came from the spirals of a seashell, which made me wonder if adding successive layers of increases would lead to a spiral that eventually wrapped around. For the pattern, I decided to go for a short shawlette version, something small and simple to highlight the shape and the increase lines. 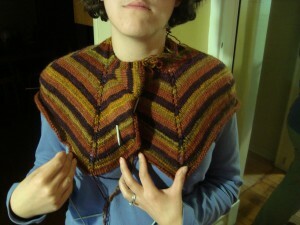 One of the reasons I’d first put this shawl aside was that I just couldn’t find an edging that I liked. I looked and looked, but nothing was quite right. I wanted something with a little lace to it, but that preserved the simplicity of the shawl. I’ve found myself more and more drawn to simple, understated stockinette pieces lately, and I didn’t want anything too showy to distract from the gentle play of color in the yarn. 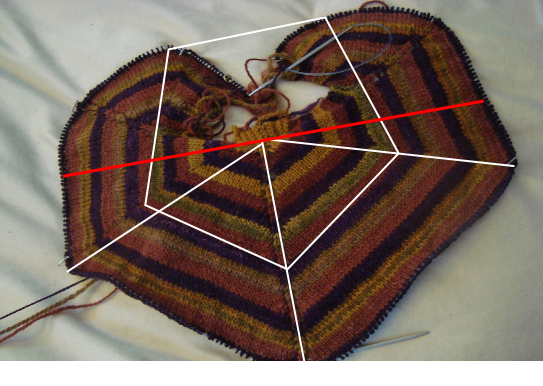 The edging would also need to have a gauge similar to the stockinette shawl body. When I looked this time, I found the perfect thing right away. I stumbled across this simple edging with columns of yarnovers and decreases, making a beautifully scalloped edge in the first book I opened. I must admit I’m rather smitten. See how it curls around at the very tips? 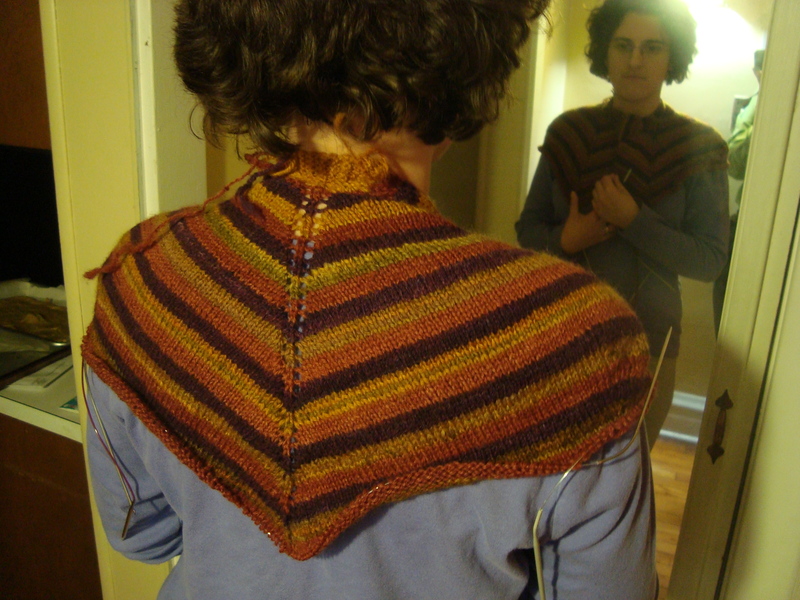 Because of the flared shaping, the shawl front looks almost ruffled when worn open. 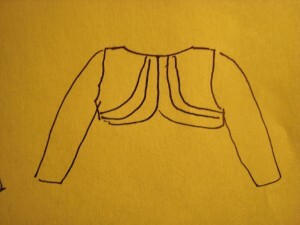 Or it can wrap around to be worn closed. 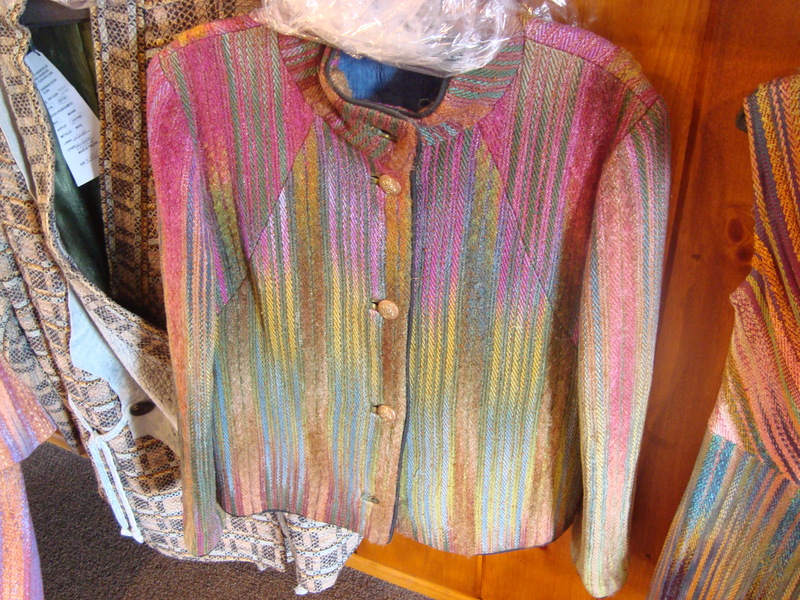 You can see echoes of the sweater in this shot, I think. The original plan was to continue the increases and make the shawl a few inches longer, so that the ends would wrap up and over the shoulders. I decided to stop here, largely because I wasn’t loving working with this yarn. 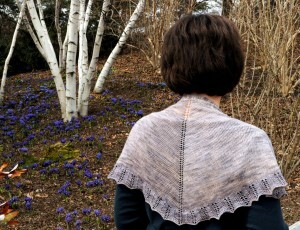 The shawl is knit in Knit Picks bare lace, which I dyed with Logwood purple in a workshop I took a couple of years ago. 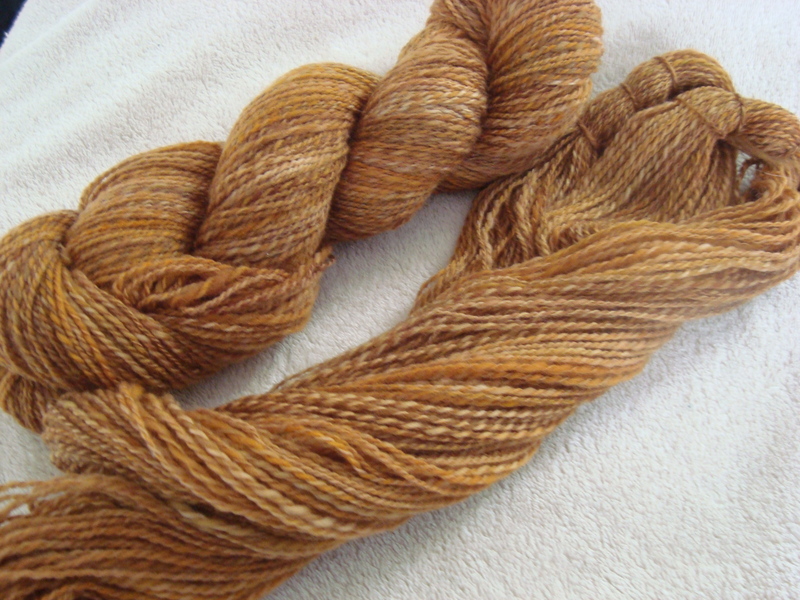 I love the color, but something in the dyeing left the yarn a little rougher than before, and it wasn’t terribly fun to work with. 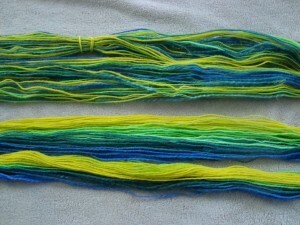 The workshop dyepots weren’t quite ideal, and the dye didn’t fully take to the yarn, so it kept coming off all over my hands while I knit. I think I’ll probably revisit this pattern again in the future with a different yarn to make a longer version; I can see myself wanting a few shawls with this kind of shaping. 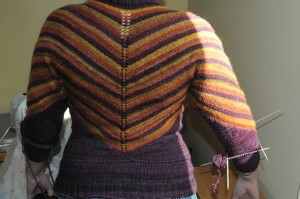 The back looks like a simple triangle shawl, with one column of yarnovers decorating the center. I used a cabled cast off for the hem, which I think gives it a nice decorative edge. 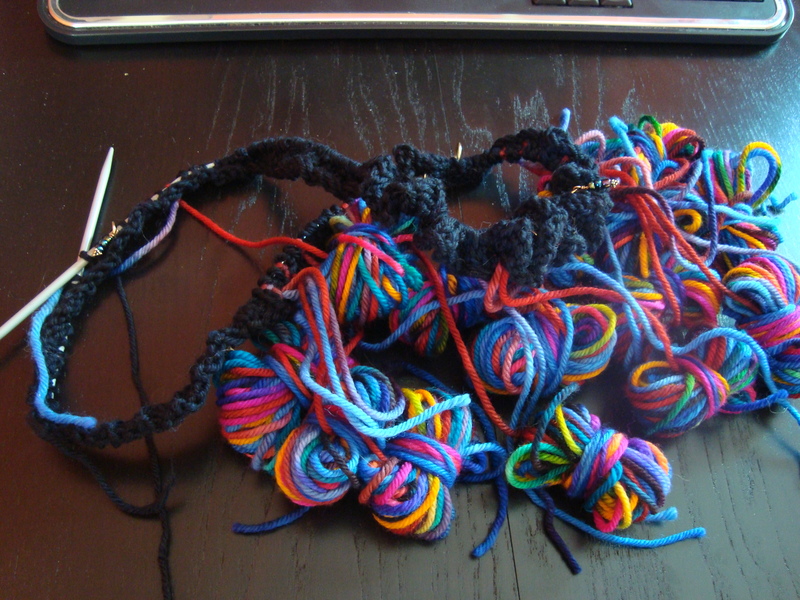 There’s an extra yarnover thrown in there to help keep it stretchy. And so, the spiral shawl is finally done. 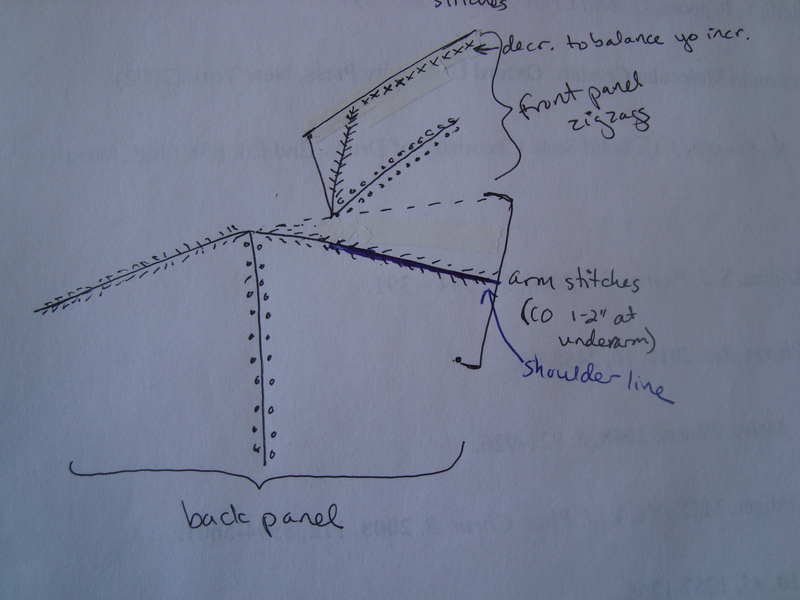 After much calculation and reworking to make sure I got all the numbers right in my scribbled notes, the pattern is also ready for test knitting, should any of you want to give it a try. 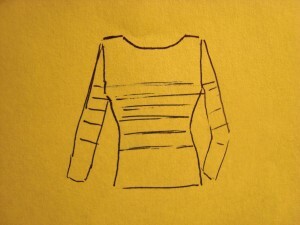 It’s quite a simple knit, with only one row at the body-to-lace transition that requires some attention. 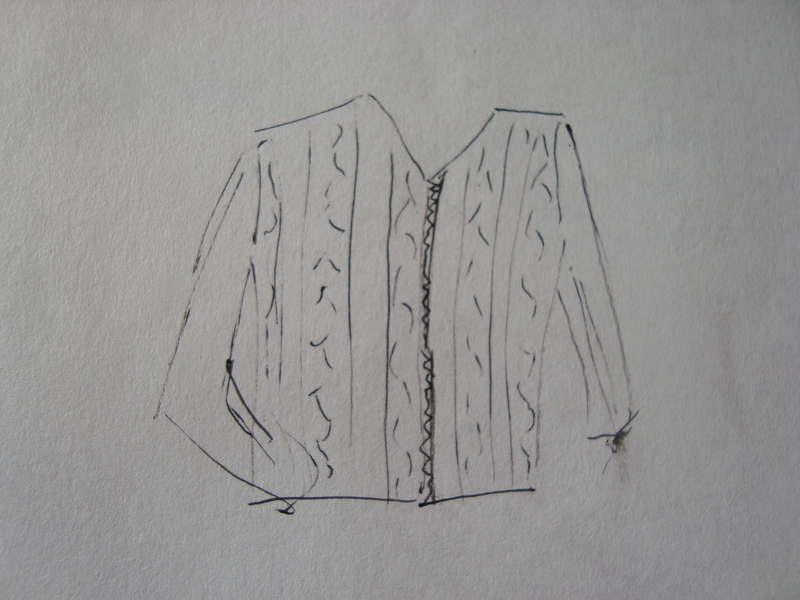 This has been a busy week, but today I finally managed to sit down and draw up some new sketches for the striped shawl sweater. 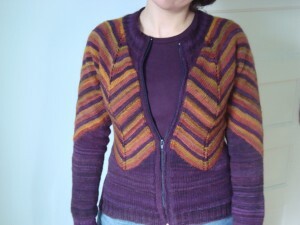 I’m in need of some mindless knitting, and there will be lots and lots of that once this design is actually on the right tracks (I think this time will be the charm). Since you are all so good at humoring me in my process posts, I thought I’d share the changes that I’m making. 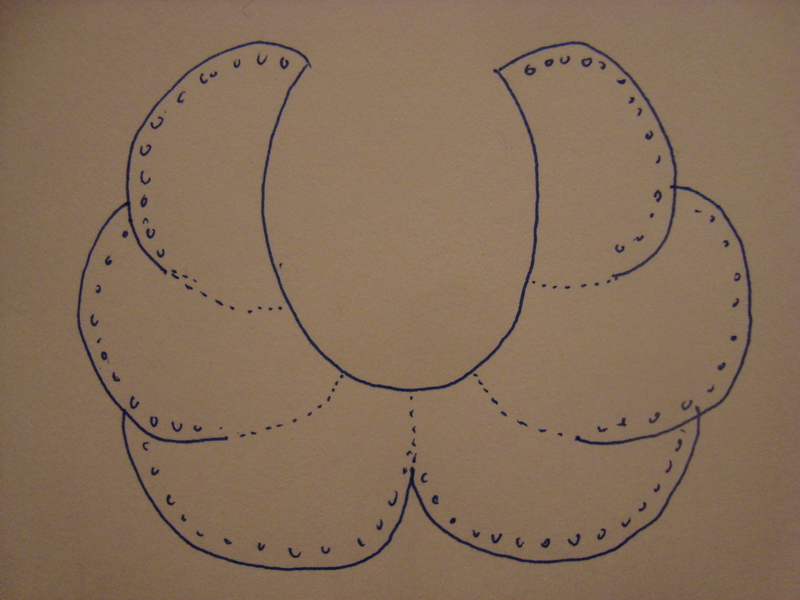 You can see that there are two different kinds of increase rows that define the main lines of my pentagon. If you squint, I think you can see them here (look for the yo lines, which are the ones with dots in the drawing above. 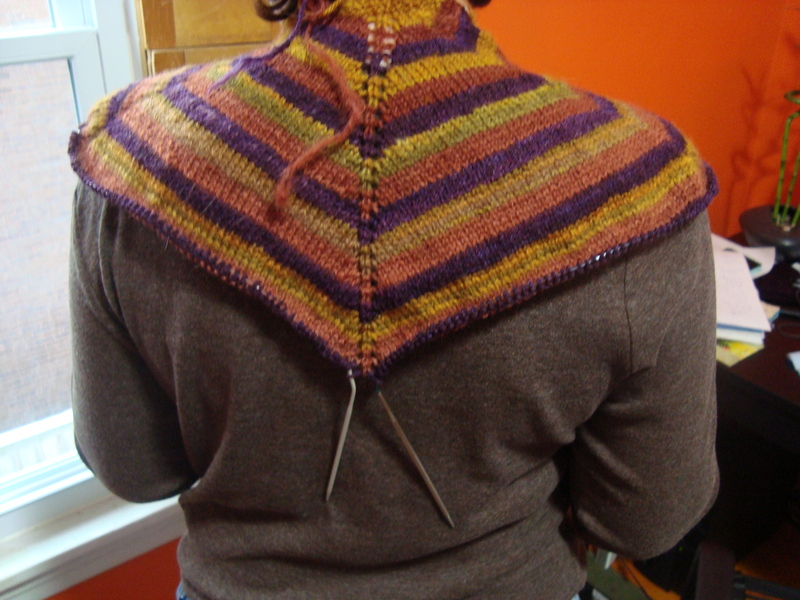 The point of the shawl back is made up of yos). 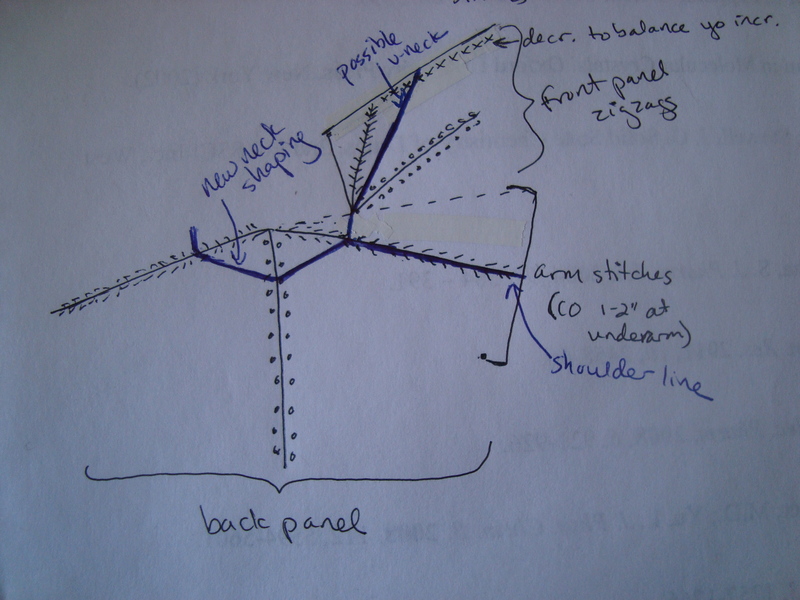 I’ll keep that increase line as the top of the shoulder and sleeve, which means that there will be more fabric to deal with in the front. 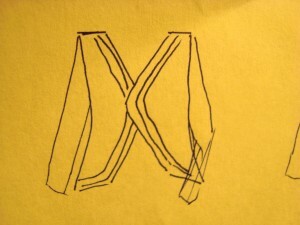 It also means that those front yos fall naturally into position for the zigzag style. This is also the part where I need to decide what to do about the neck. As you can see in the back shot above, rotating that shoulder line makes the back of the neck very high; it’s several inches above where it would normally be. That’s not necessarily something that I mind, since I’m always cold and usually want something to cover the back of my neck anyway. But I’m thinking that I will probably eliminate the first full stripe repeat, and make my cast on sit at the beginning of that second purple row. 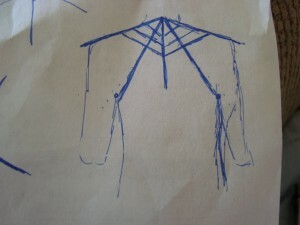 That will be a more “normal” fit to the neck, and I think it will help with the fit in the front. You can see that the fabric is sitting a little funny at the front shoulders in the zigzag picture, and I think that cutting out that extra back neck will take care of that. 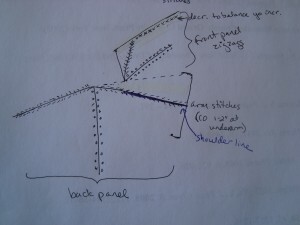 I’m also planning to eliminate the knit-on garter stitch edging, and instead plan to pick up and knit stitches to finish the collar. 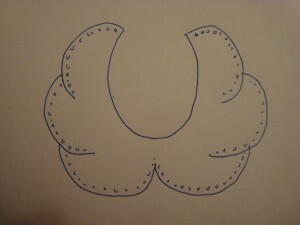 That gives me a lot more choice later to decide what I want the final collar to look like. 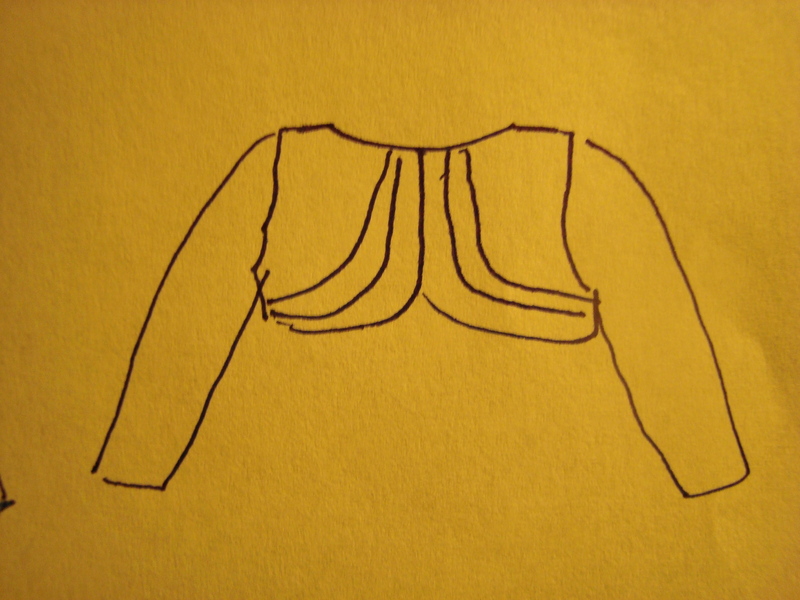 That would make a pretty deep v-neck, and the two front panels would probably meet right around the bra strap. 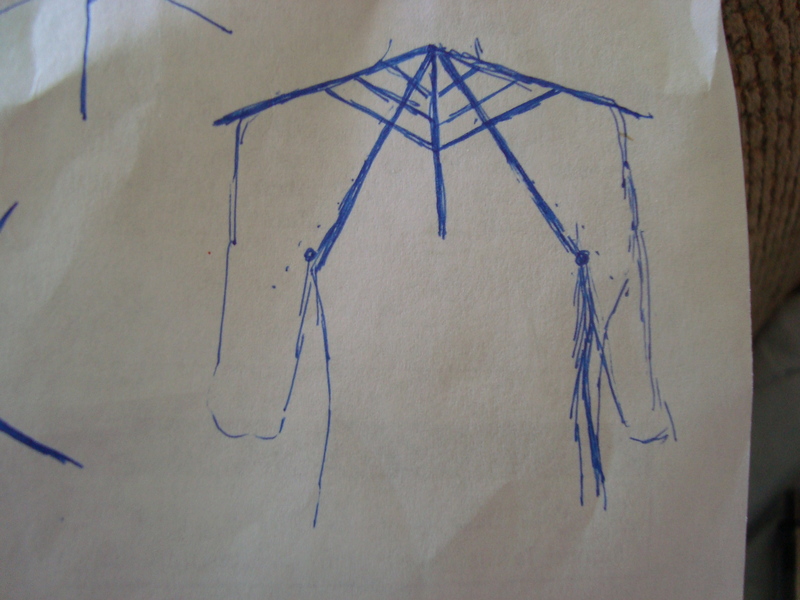 Both Branden and Ellen suggested some kind of flap or lapel front, and this seems like the best option if I’m going to incorporate something like that. 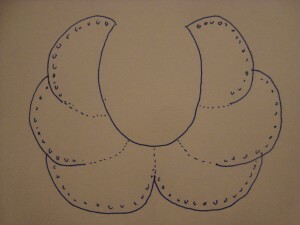 I’d probably use a solid purple to match the hemline, and just pick up stitches to add it on at the end. 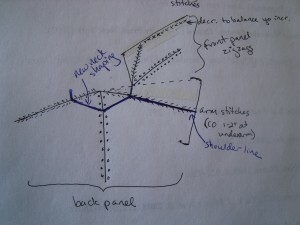 It would add another diagonal line to the front panel, and it might also cover up some of the zigzag look near the neck. 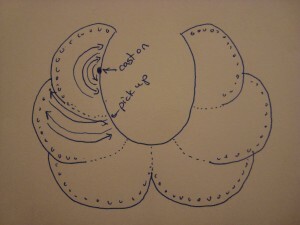 It would decrease some of the busyness of the design by adding a solid area in the front panel, as Jocelyn (I think?) had suggested earlier. 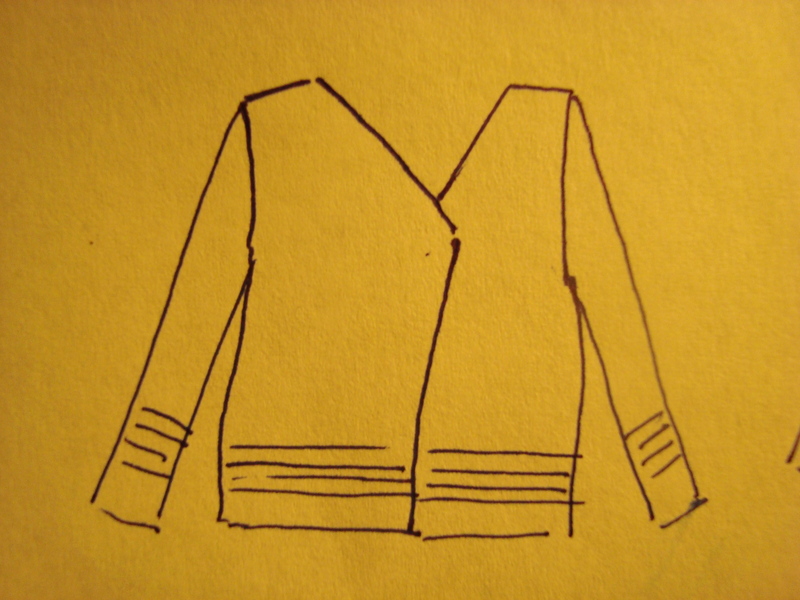 I’ve been planning this as a zippered cardigan, so I want something that can be either open or closed, but I don’t think that a solid v would take too much away from the zigzags, especially if it came up into a high solid collar. 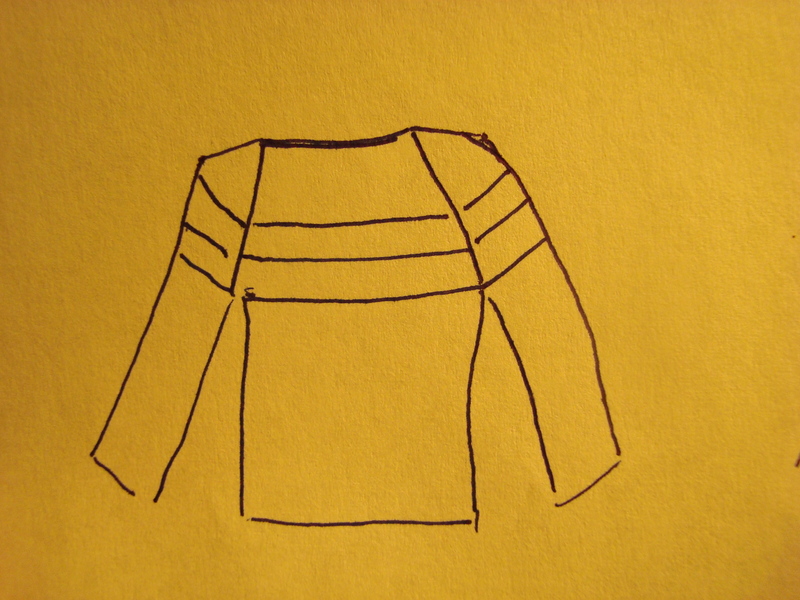 After realizing that my latest “fix” has still not fixed the striped sweater, I finally sat down today to figure out what is really going on. I’ve been tweaking one thing after another, but clearly there’s something bigger going on that just isn’t working. Whenever I get to this point, it’s time to stop and reevaluate to see what I’m missing. Part of the problem is that I didn’t start this project expecting it to be a sweater, and so I hadn’t gone through all the design thinking that I’d usually do before casting on. So this afternoon, I sat down and looked at it very hard. 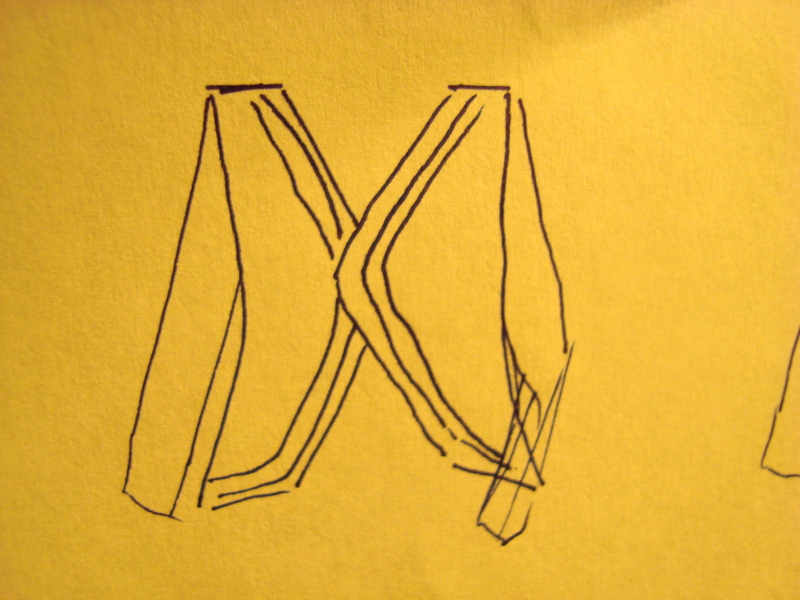 And I realized that it’s not a hexagon. It looks like a hexagon, doesn’t it? But it isn’t. Those angles are not 60 degrees. In fact, they’re much closer to 72 degrees, a fact which quickly explained all the problems I’ve been having. 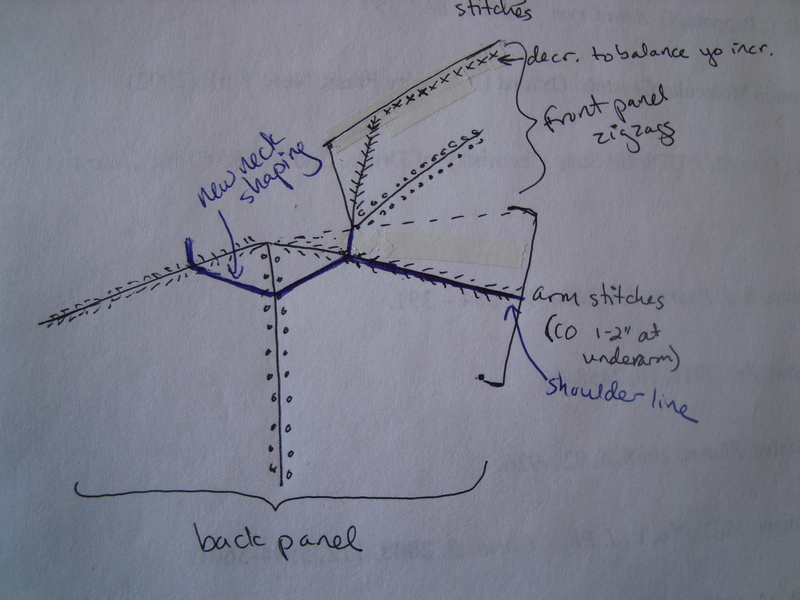 You can see that the first one has the increase line right along the top of the shoulder, but I’d moved it into a more traditional Raglan position in the later versions. 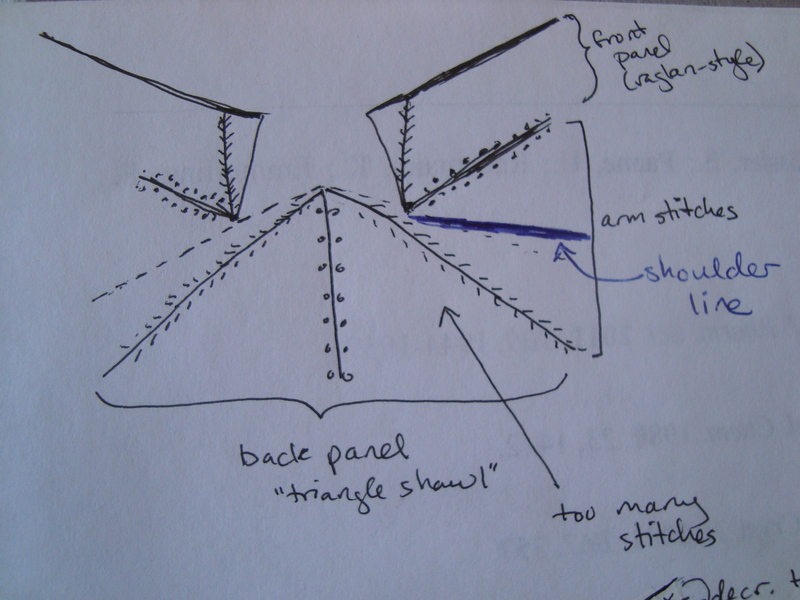 The Raglan line gave me a better fit on the neck, and would have been the perfect solution if I were working with a hexagon, since the stitches would have been evenly divided between front and back. But I’m not working with a hexagon. I’m going to have to pull back the latest fix anyway, but tonight I tried it on to check that changing the shoulder line is the right thing to do. It is. The trouble is, moving the shoulder line puts all those extra stitches in the front, so now I need to figure out what to do with them there. I’ll definitely have to cut a bunch of them out, but the question is: which ones? 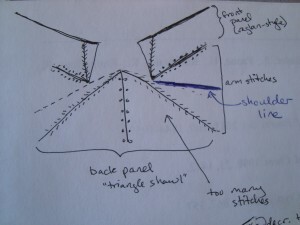 I can take some stitches out of the shoulder area to preserve the pentagon shape and make Raglan shaping in the front. This is very close to what I was expecting with the previous design. 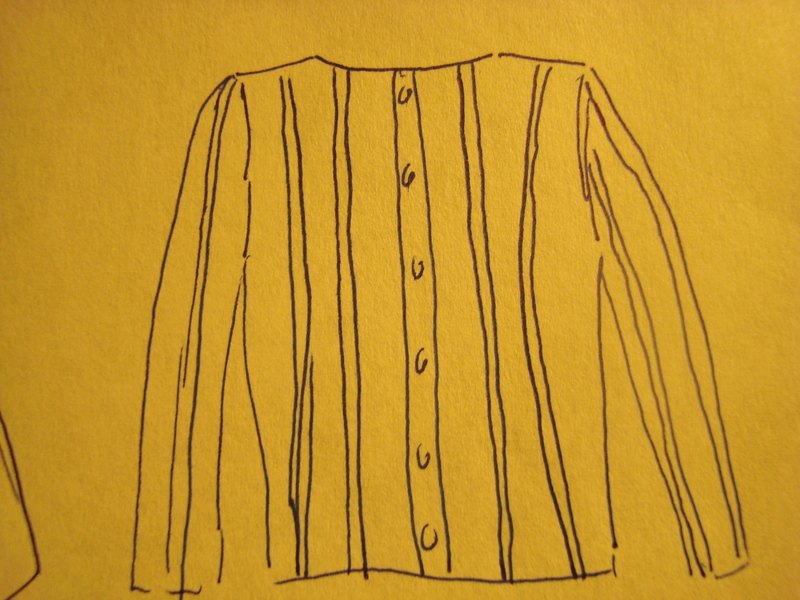 The Raglan is a pretty safe option; horizontal stripes aren’t my favorite thing ever, but it’s a classic design and I know I won’t feel too obtrusive wearing it. Or, I could take the stitches out of the front panel. I like the stripes going up over the shoulders in this one, but I’m not sure I like the front placket. Something in it feels very Pride and Prejudice to me (not that that’s a bad thing, but it’s not quite where I was expecting this design to go). Still, I think this one has the potential to grow on me. The last option is the one that has me most intrigued, but it also has the most potential to go wrong. This is just another way of taking increases out of the front panel. I think the zig zag effect is interesting, but I’m not sure about adding two more “arrows” to this design in potentially attention-grabbing places. 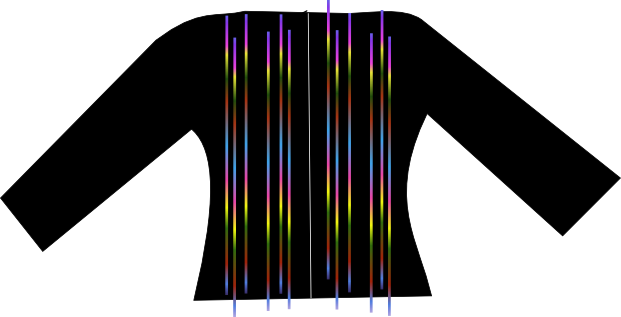 I’d continue the stripes down to mid-waist to match the back, which I think would reduce the arrow effect, but I really don’t know how I feel about this one. My first thought was that I absolutely didn’t like it (clown ruff, anyone? ), the second thought was that maybe it wasn’t so bad, and now it’s kind of refusing to step aside. I like the look of it better when the front is open, and it does do a good job of highlighting the geometry. Branden is strongly in favor of the zig zags, followed by the front placket, leaving the Raglan in last place. 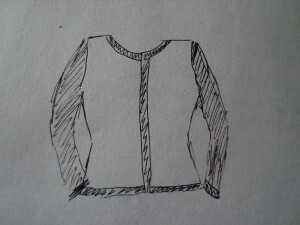 Raglan is low on my list, too, except that I don’t have to worry about whether or not I’ll wear it. The other two are still fighting it out in my mind. There comes a moment in every crazy project where you have to decide whether to dive in or whether to save your sanity and walk away. 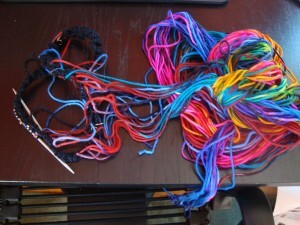 But then the issue of grist meant that I ended up with 30% less yarn than I’d expected from that fiber. 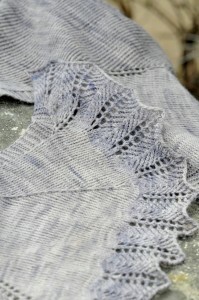 Fortunately, I am working on the Falkland lace sweater at the same time, with the same yardage. So I have a pretty good idea of how far 928 yards will stretch. 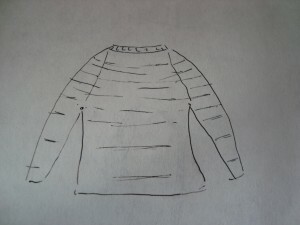 The answer is that it will stretch enough, but only if I want a lightweight sweater with very open lace. 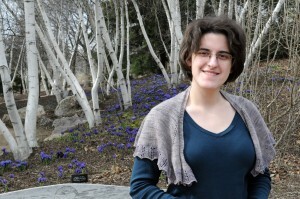 I happen to love the way the Falkland sweater is coming out, but it’s probably not a weight that I’ll use for more than a few months a year, and definitely not in the fall. Also, I think that a lace that open really needs a semi-solid yarn to keep the color from fighting with the lace pattern. 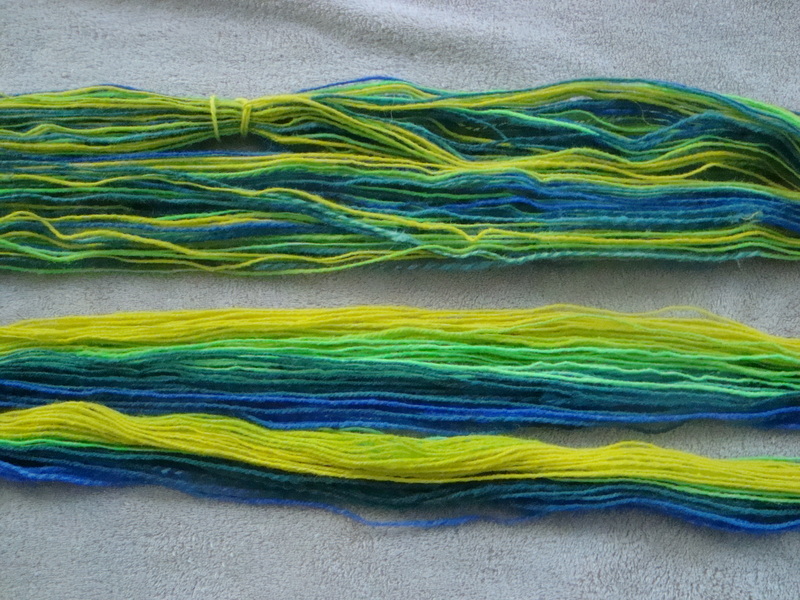 This yarn might work in a more solid lace, but I think it would be too much variegation for a really open pattern. So that sent me back to the drawing board. 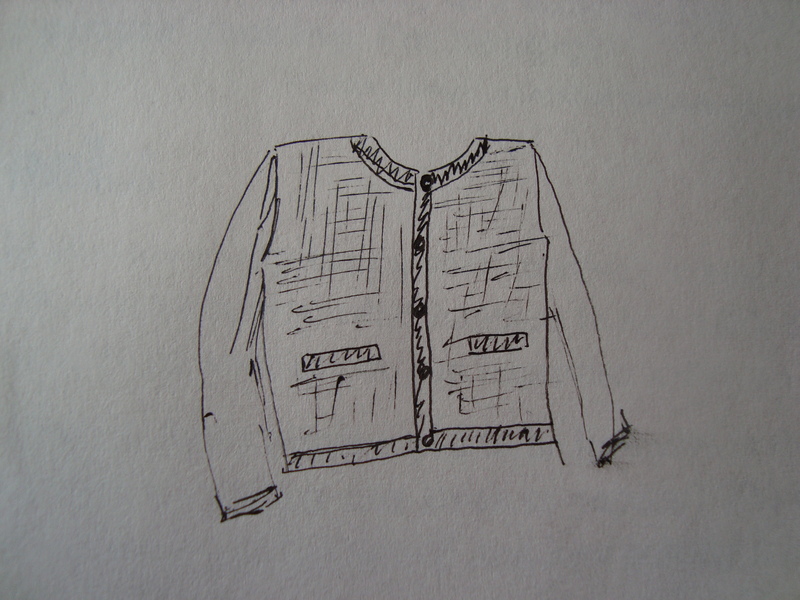 Somewhere in our emails back and forth, Jan suggested that maybe a Chanel-inspired jacket would be the thing. This had me enchanted for quite a while, trying to figure out how I might stretch the yarn to make it work. 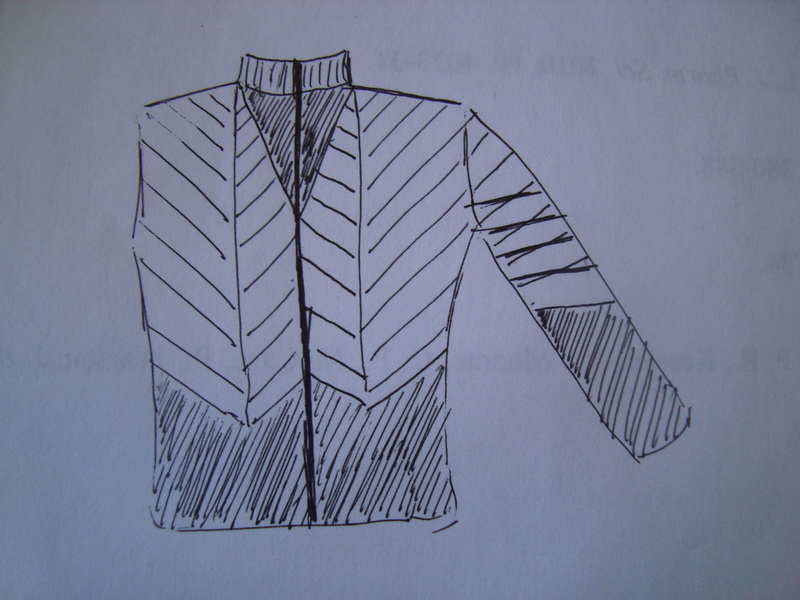 It would have to be a short jacket because of the yarn restrictions, but I could use a different color as trim to help stretch it out a bit. Unfortunately, I’d want this to be a really solid, stable fabric, probably with an almost woven texture. And that spells heavy yardage requirements. 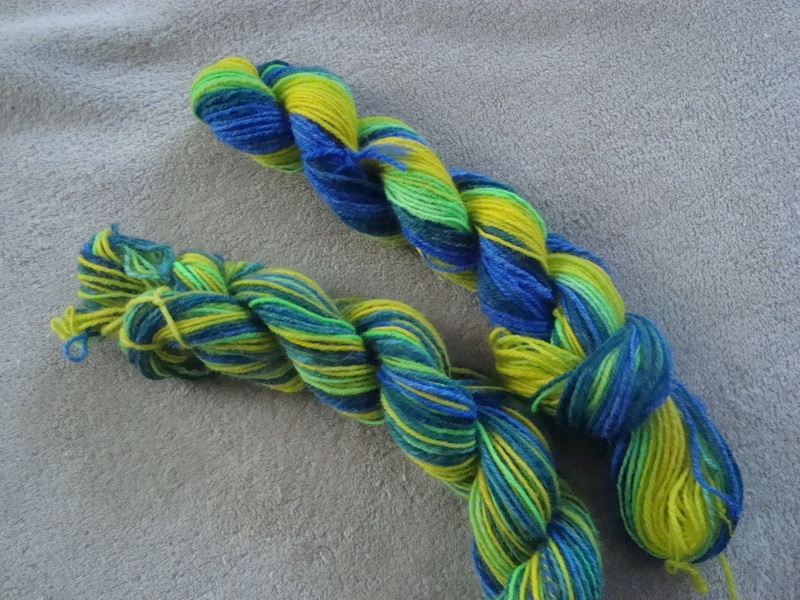 I thought about using two colors at once and dyeing something to match, but I still don’t think that will stretch the yardage enough. 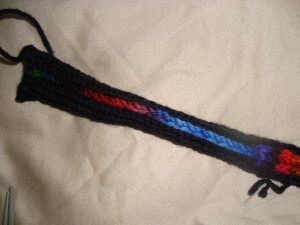 I also thought about actually weaving it. You get a lot more fabric for the yardage with weaving than you do with knitting, so I could make this go farther on the loom. I’d also be using a different yarn for the warp, so I’d automatically get twice as far. I did some calculations, and really looked carefully at what it would take to cut these pieces from the widest fabric I can make on my loom, and I think it would still be cutting it a little too close. 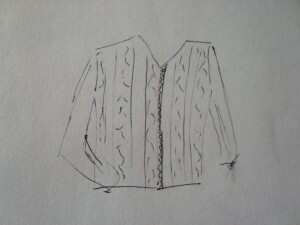 If I wanted a really cropped jacket or short sleeves I could probably make it work, but I think I’m unlikely to have occasion to wear either of those styles very often. So. 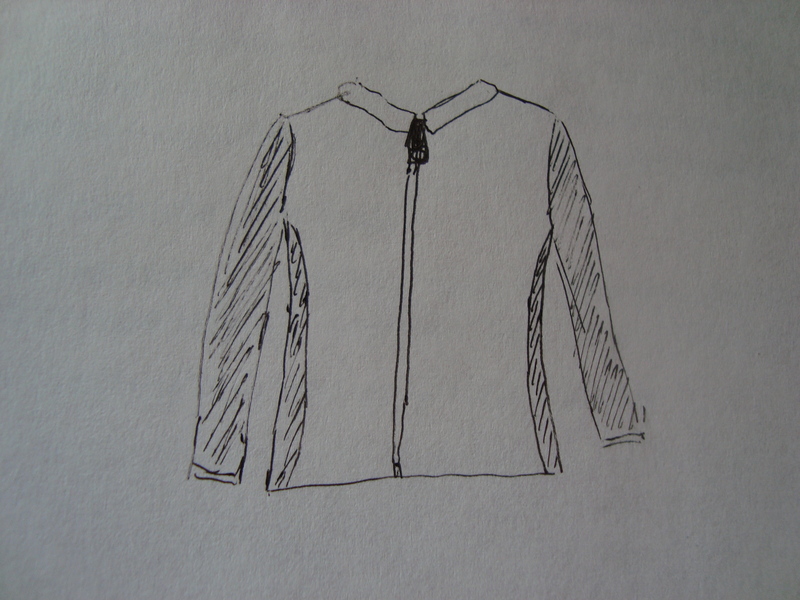 Definitely keeping this jacket idea in the active list, but probably not in this yarn. 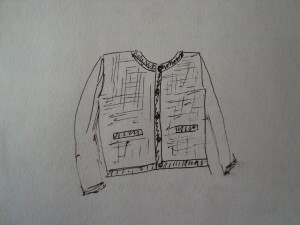 I think it would look great knit up, though. 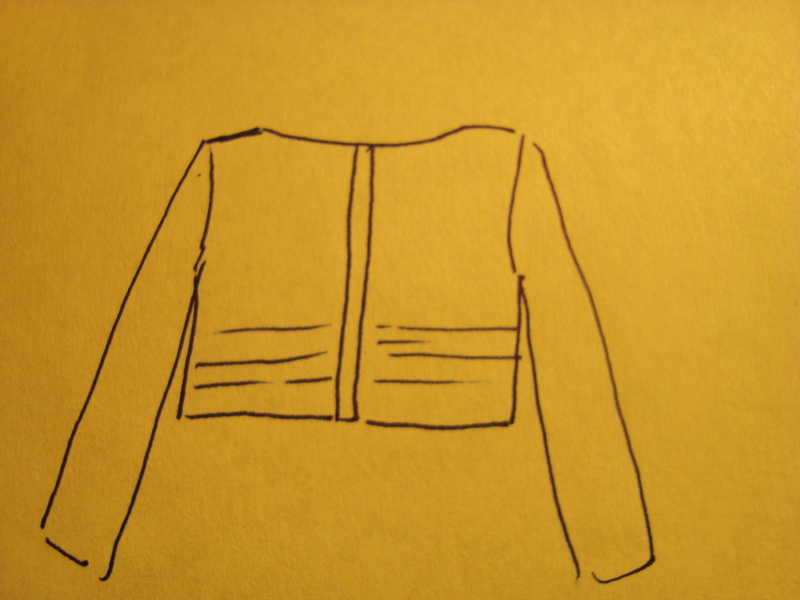 Then I thought about working a more fitted jacket and having the sleeves in a contrasting color. 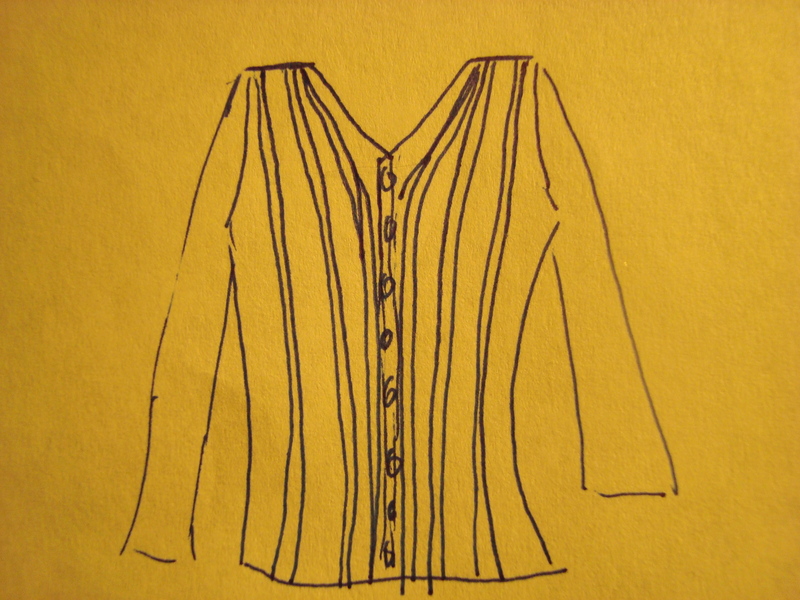 The extra fitting takes out a significant portion of the yardage, and the contrasting sleeves cut out a lot more. 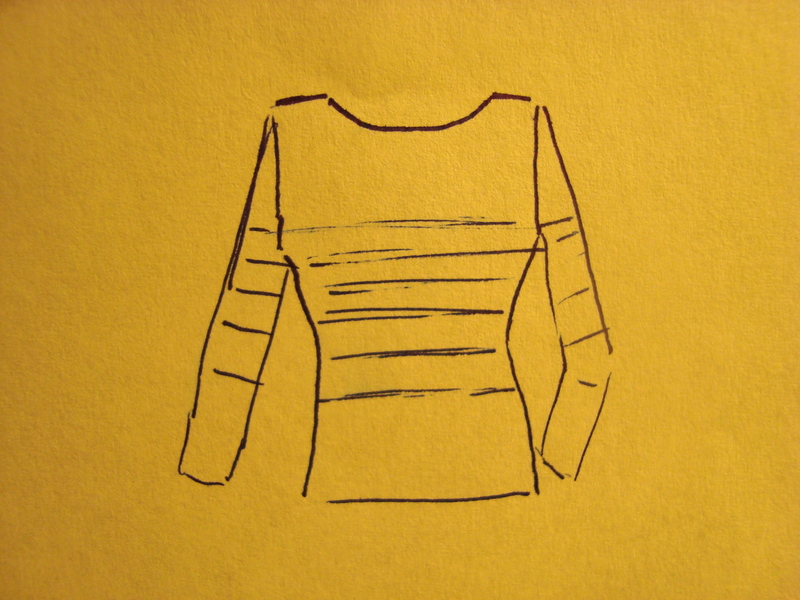 If the body were worked in two colors, I might have enough to make it on this design. 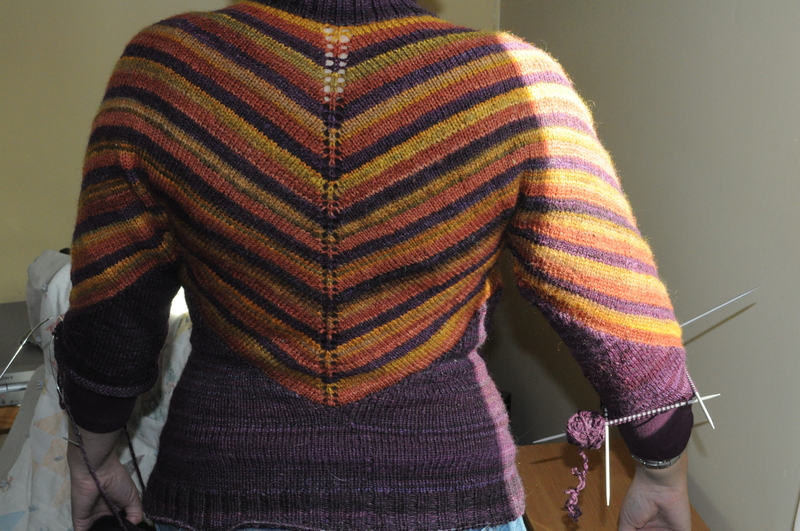 Based on the gauge of the Falkland sweater, I still don’t think I could get the full vest out of the fall colors yarn in stockinette. But colorwork might just do it here. Olive green semisolid at the neck would put a spacer between the orange and my skin tone (one of the reasons that I don’t wear orange much is that I have a good bit of yellow in my skin and sometimes yellow/orange can make me look jaundiced). Then I’d do a dark brown for the main body, tying in both the greens and browns of fall. 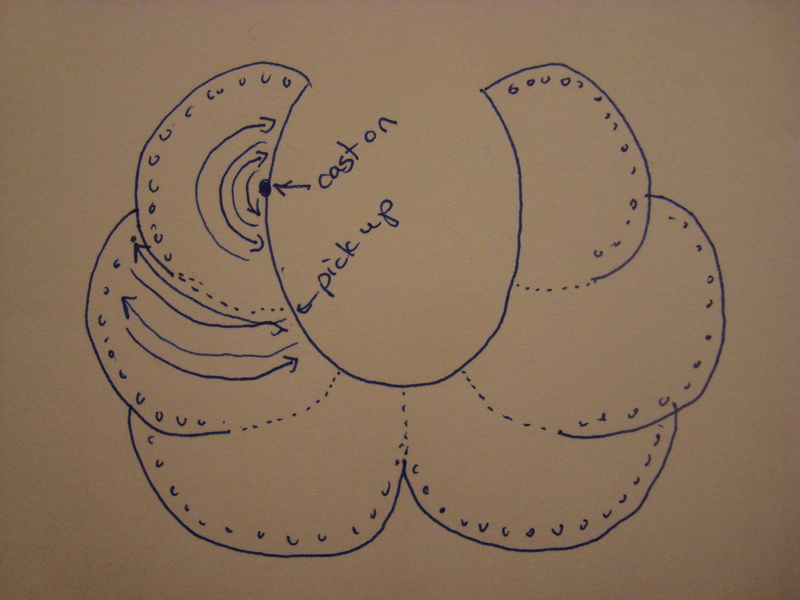 This could work, and it was actually my #1 choice until I sat down and started drawing these out. Seeing it on the page, though, it’s not quite as appealing as some of the other options. It’s still high on the list, but I’m not sure it’s right for this yarn. 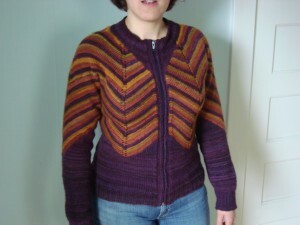 I could also do some kind of colorwork or striping to spread the orange highlight yarn out over the entire sweater. If done well, I think this could be absolutely stunning. 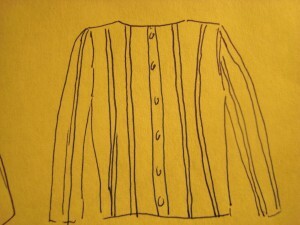 Unfortunately, artistic arrangement of stripes is not my greatest strength. 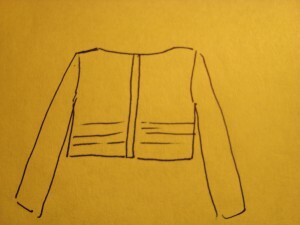 I am usually a little too mathematical and geometrical to come up with the kinds of dynamic striping that I’d want here. 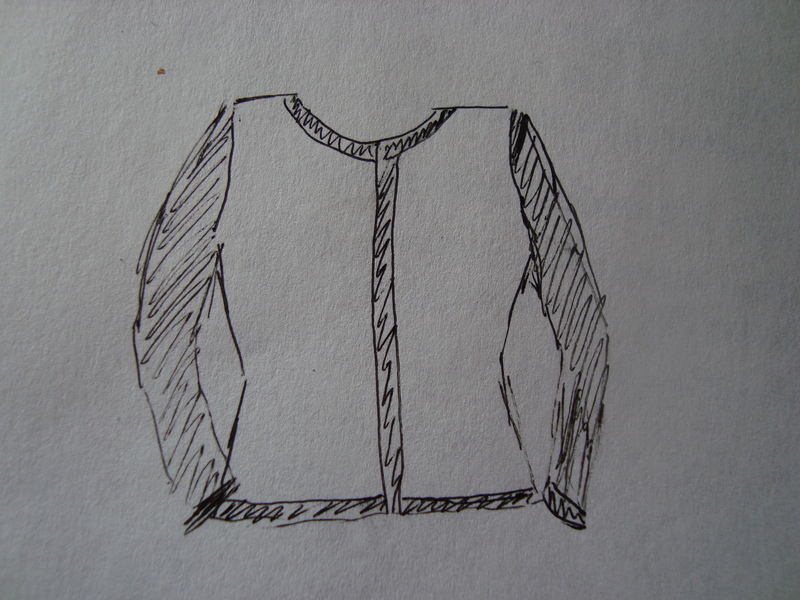 The sketch makes it look rather unappealing, doesn’t it? 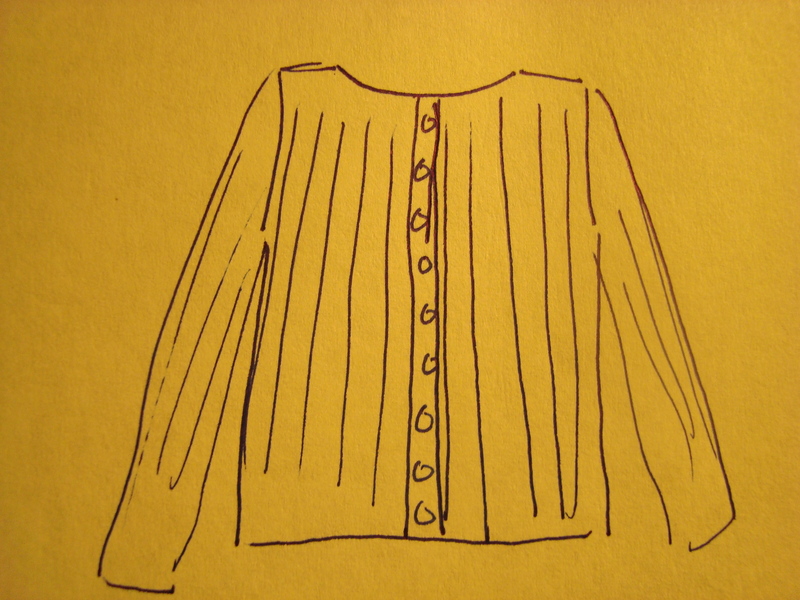 My current favorite leans back toward the more tailored jacket look, and is loosely based on a commercial sweater that I wear all the time. 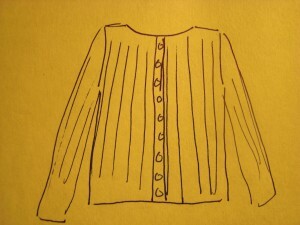 This would be a zip-front cardigan that’s fitted but still has a good bit of ease. It’s a more casual cut, so I’m more likely to wear it often. The seam between the side panels and the front fabric would give it a nice silhouette look, especially if there’s a strong contrast between bright body and dark panel colors. 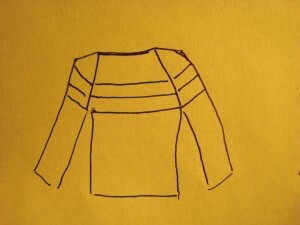 The sleeves could be a contrast color, and the underarms would be a solid or semi-solid to match the sleeves. 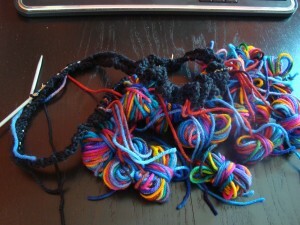 That would take out a good 8″ of fabric from the body alone, helping the yarn to stretch further. 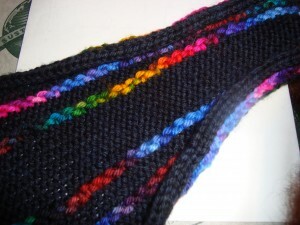 The rest of the body could then be colorwork or a two-color textured pattern to stretch the yardage again (which should make up for the extra density of the fabric). 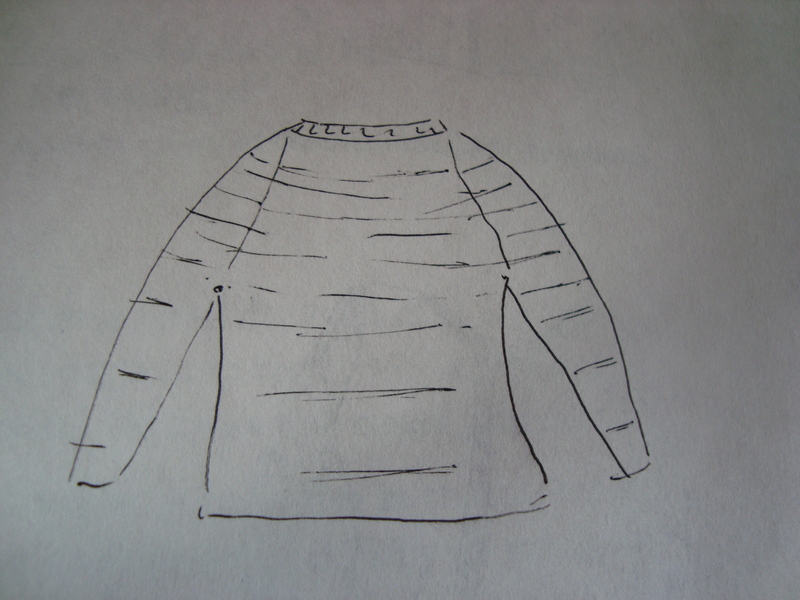 I’d probably do an olivey-green for the sleeves and underarm panels, and a deep, dark brown for the other body yarn. 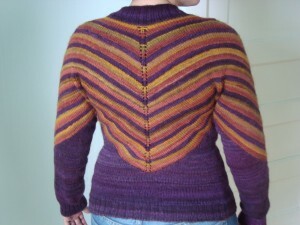 This could be done with any number of colorwork or texture designs. The dark brown should help the orange to “pop”, like the dark branches highlighting the fall foliage. Adding in the green and brown also pulls this closer into my usual color palette and might make it more likely that I’ll wear it often. I’m a little torn about that last part. 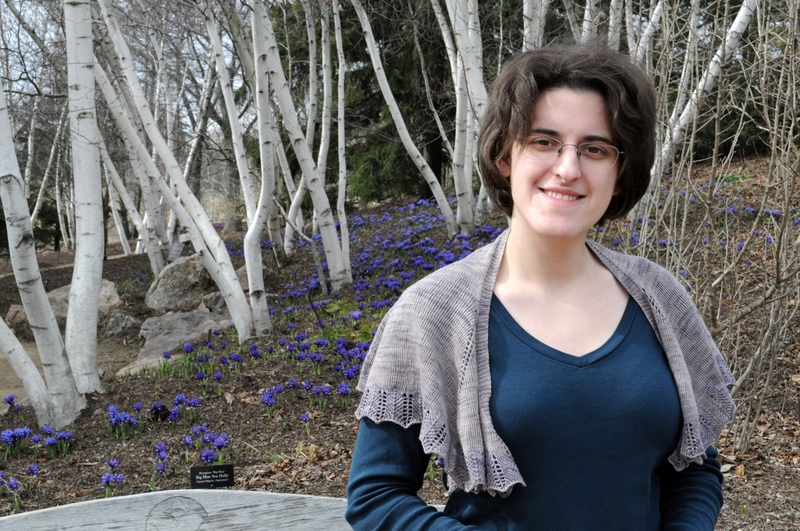 Practically speaking, I do think that I’m more likely to wear greens and browns than just orange. I was kind of in love with the pure orange-reds, though. The strong, bold colors are the whole point of this project, after all. I don’t want to dilute them down. I also don’t want this to be something that has to be worn as an earth-tone; I like the idea of making it a real focus piece. I think that I should be able to come up with a colorwork design that uses the darker colors to highlight the oranges, though. If I’m good, I should be able to use the design to narrow the focus even further, from the garment level right down to the individual yarns. I don’t know if I’m that good, but I think I want to try. The other slightly scary thing about this design is the construction. 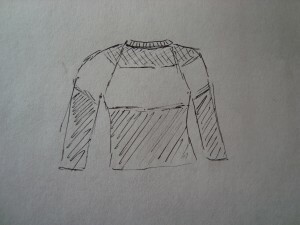 I haven’t done much designing for seamed sweaters, so this one will be a bit of a stretch. Add to that the fact that there will be 5 body panels, and that’s a lot of planning. 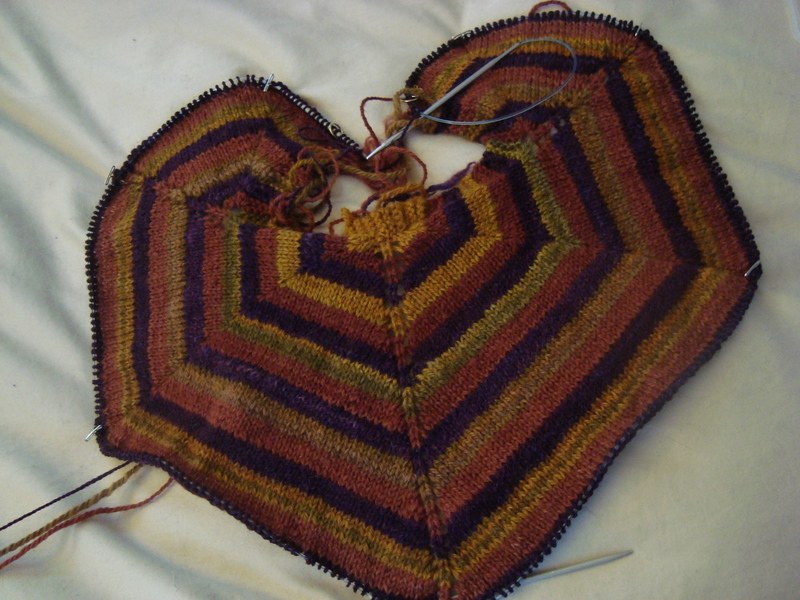 I’m thinking of doing it with steeks, which will let me do the colorwork in the round and then seam at the end, but that means no trying on and checking of design along the way. 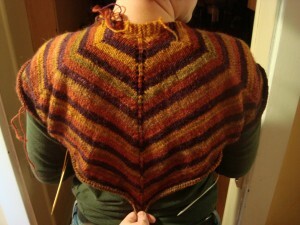 It will also be a very oddly shaped garment until the steeks are cut. I think that’s manageable, though. Those lines aren’t really very complicated, and I really like the semi-tailored look that the side panels give to the design. 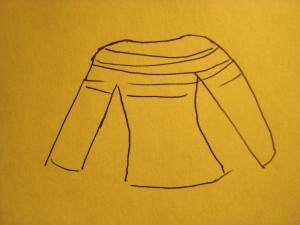 It’s not a closely fitted garment, so there should be some room to adjust at the end, if necessary. 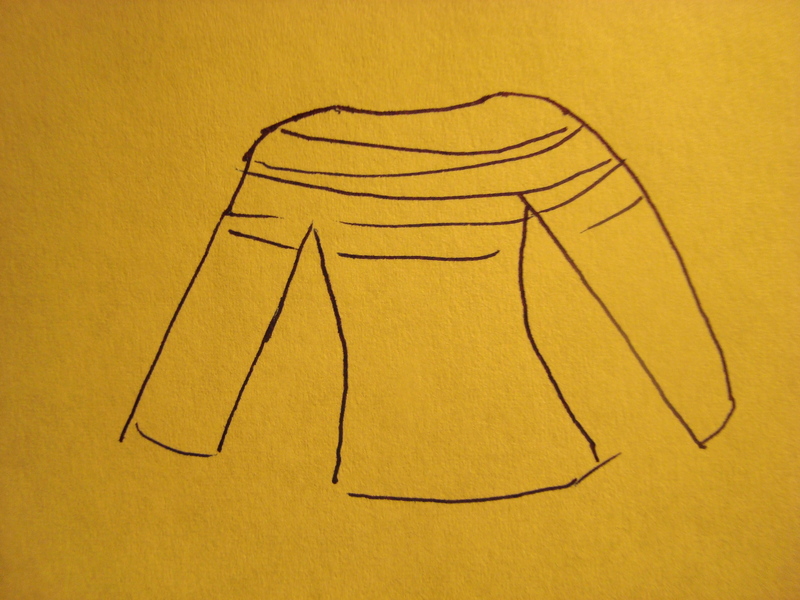 It would also give me a reason to steek a full sweater, which very much appeals to the seamstressy side of me. 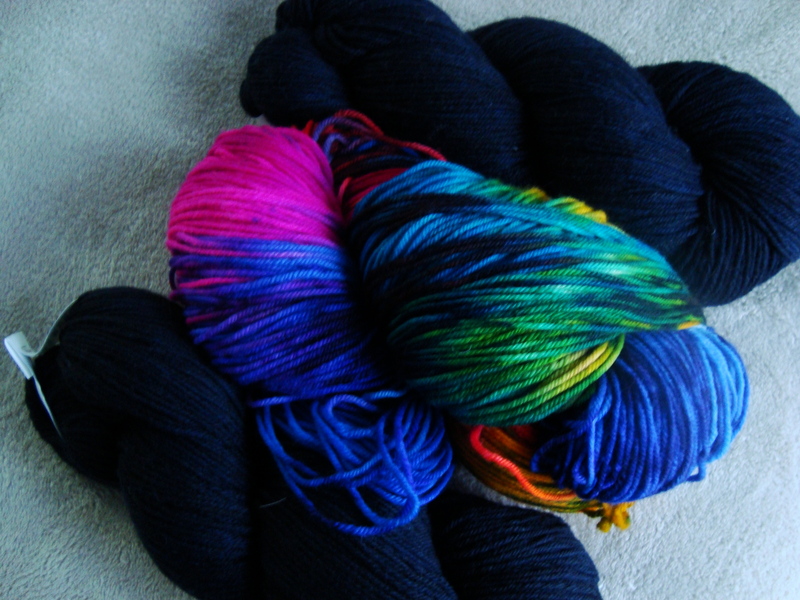 The colorwork and contrasting sleeves will guarantee that I have enough of the focus yarn, and I can dye and spin up as much as I need of the other colors. So, I think this is it. Still dithering, poking around and exploring other ideas. 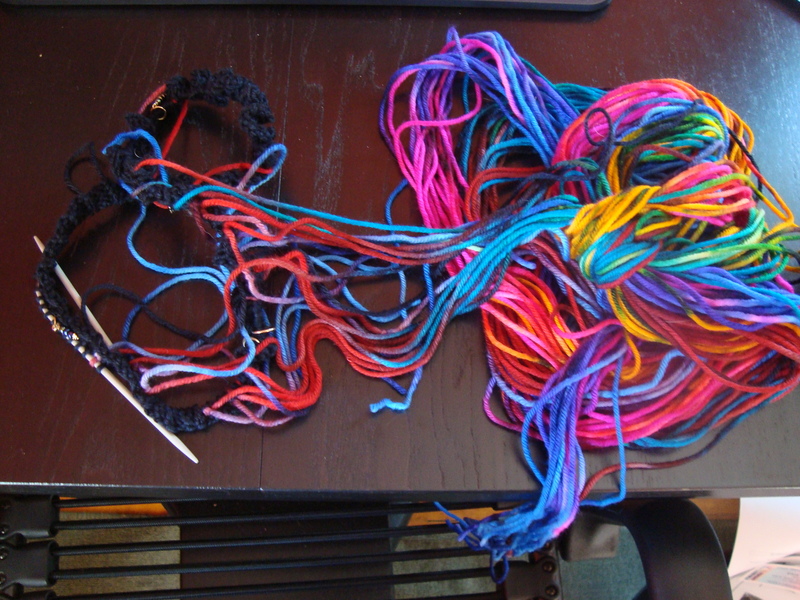 I’d still need to sit down and figure out how much more yarn I need to spin, and to decide on the perfect colors to match. Solid? Semi-solid? Something else? So many decisions still to make, but I think we’re getting closer. DesigKnit is powered by	WordPress 4.8.9 . Page generated in 0.776 seconds using 118 queries.